emoji ® – The Iconic Brand alongside Bravado have teamed up with Zak Designs for a partnership on drink-ware, lunch-ware, seasonal gifts and special event items and will be launching in 2018 which will further product categories for emoji® in the UK with now over 30 partners. The official emoji® brand is already represented globally by over 500 licensee while the company owns more than 800 trademarks and 10,000 copyrights. The partnership with Zak Designs will mean more exciting and different product to be released into the UK market. 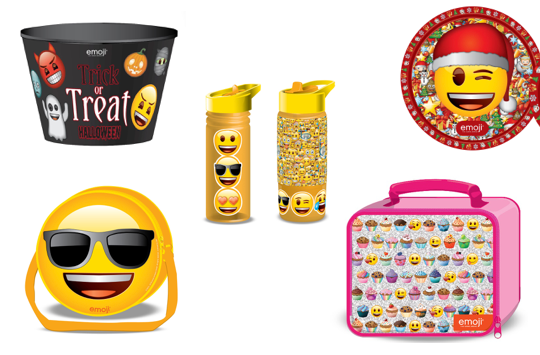 “At Zak UK, we want to extend our tradition of exceeding peoples expectations of the products they use to eat and drink with every day and we are very excited at our new partnership with emoji® – The Iconic Brand” says Chris Howard from Zak UK. With the same entrepreneurial spirit our company was founded on, we will focus on creating high-quality, FUNctional and innovative products that surprise and delight with each bite and every sip and promote a healthy lifestyle for every member of the family who already engage and communicate through icons. “We are happy to team up with Zak UK says Marco Hüsges, CEO and Founder of the emoji company. Quality and Value, along with Innovation and Unique products are the key mantras of Zak´s product range development within everyday drink-ware and lunch-ware, seasonal gifts and special event items which will mirror the way consumers engage with their favorite characters, Hüsges adds.” Zak will create bespoke ranges to target both kids, tweens and millennials and try to capture the DNA of the emoji® brand within its developments. The new partnership with emoji® – The Iconic Brand will allow Zak to expand their horizons and fully embrace the emoji® brand values which is a great fit for our product range.